Demanding electric, magnetic and power requirements, harsh radiation, and strict planetary protection rules are some of the critical issues that had to be tackled in order to move ESA's Jupiter Icy Moons Explorer – JUICE – from the drawing board and into construction. Scheduled for launch in 2022, with arrival in the Jovian system in 2029, JUICE will spend three-and-a-half years examining the giant planet's turbulent atmosphere, enormous magnetosphere, its set of tenuous dark rings and its satellites. It will study the large icy moons Ganymede, Europa and Callisto, which are thought to have oceans of liquid water beneath their icy crusts – perhaps even harbouring habitable environments. The mission will culminate in a dedicated, eight-month tour around Ganymede, the first time any moon beyond our own has been orbited by a spacecraft. JUICE will be equipped with 10 state-of-the-art instruments, including cameras, an ice-penetrating radar, an altimeter, radio-science experiments, and sensors to monitor the magnetic fields and charged particles in the Jovian system. In order to ensure it can address these goals in the challenging Jovian environment, the spacecraft's design has to meet stringent requirements. An important milestone was reached earlier this month, when the preliminary design of JUICE and its interfaces with the scientific instruments and the ground stations were fixed, which will now allow a prototype spacecraft to be built for rigorous testing. The review also confirmed that the 5.3 tonne spacecraft will be compatible with its Ariane 5 launcher. Operating in the outer Solar System, far from the Sun, means that JUICE needs a large solar array: two wings of five panels each are foreseen, which will cover a total surface area of nearly 100 m², capable of providing 820 W at Jupiter by the end of the mission. 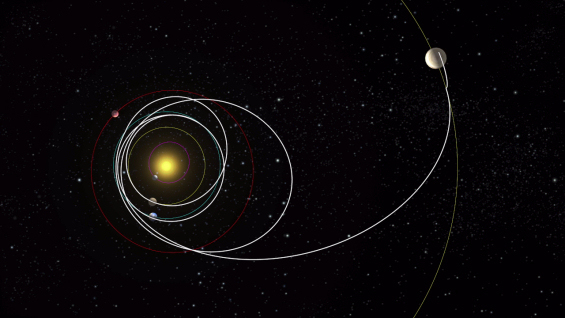 After launch, JUICE will make five gravity-assist flybys in total: one each at Mars and Venus, and three at Earth, to set it on course for Jupiter. Its solar panels will have to cope with a range of temperatures such that when it is flying closer to the Sun during the Venus flyby, the solar wings will be tilted to avoid excessive temperatures damaging the solar cells. The spacecraft's main engine will be used to enter orbit around the giant planet, and later around Jupiter's largest moon, Ganymede. As such, the engine design has also been critically reviewed at this stage. Special measures will allow JUICE to cope with the extremely harsh radiation that it must endure for several years around Jupiter. This means careful selection of components and materials, as well as radiation shielding. One particularly important topic is JUICE's electromagnetic 'cleanliness'. Because a key goal is to monitor the magnetic fields and charged particles at Jupiter, it is imperative that any electromagnetic fields generated by the spacecraft itself do not interfere with the sensitive scientific measurements. This will be achieved by the careful design of the solar array electrical architecture, the power distribution unit, and the reaction wheels – a type of flywheel that stabilises the attitude. The review also ensured that JUICE will meet strict planetary protection guidelines, because it is imperative to minimise the risk that the potentially habitable ocean moons, particularly Europa, might be contaminated by viruses, bacteria or spores carried by the spacecraft from Earth. Therefore, mission plans ensure that JUICE will not crash into Europa, on a timescale of hundreds of years. "The spacecraft design has been extensively and positively reviewed, and confirmed to address the many critical mission requirements," says Giuseppe Sarri, JUICE Project Manager. "So far we are on schedule, and are delighted to begin the development stage of this ambitious large-class mission." ESA's industrial partners, led by Airbus, now have the go-ahead to start building the prototype spacecraft units that will subjected to tough tests to simulate the conditions expected during launch, as well as the extreme range of environmental conditions. Once the design is proved beyond doubt, the flight model – the one that will actually go into space – will be built.